1. Every takeoff is optional. Every landing is obligatory. Try to make always sure that the number of your landings correspond to the number of your takeoffs. 2. Pushing the joystick means that buildings become bigger. Pulling the joystick means they become smaller. There is a single exception only: keeping the joystick pulled means that buildings begin to become bigger again. 3. It is not dangerous to fly. It is dangerous to crash. 4. It always is preferable being on the ground and wishing oneself upwards instead of being in the air and wishing oneself to the ground. 5. The ONLY moment you have too much fuel is when the airplane is on fire. 6. 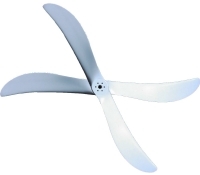 The propeller in front of the airplane is a big fan designed for refreshing the pilot. If it stops, it begins to get warm... It is therefore important to keep it running during the flight. 7. In case of doubt you keep your level or rise. Never before an airplane has collided with the sky, whereas some have collided with the ground. 8. You can judge a good landing by the fact that you are able to leave the airplane on your own feet and without any injuries. A brilliant landing is characterized by the fact that the airplan can be used further on. 9. You have to learn from the mistakes of others, as you will not live long enough to make them all yourself. 10. If after landing you have to go full throttle in order to reach the terminal, you forgot to lower the landing gear. 11. The chance to survive a landing is inversely proportional to the approach angle. The wider the approach angle, the slighter is the chance to survive and vice versa. 12. Keep out of the clouds. The reflections shimmering like silver in the clouds could be other airplanes. Even mountains are known for hiding themselves in the clouds. 13. Not a single case is reported where airplanes made of metal flying hundreds of kilometers per hour have won the fight against the ground which is unmovable. 14. Rough-and-ready rule: In order to have a calm flight you have to point out in front of the airplane where you want to go . 15. There are old pilots and there are audacious pilots. However, there are no old audacious pilots.